Restored in 1996, this landscape features rustic benches and an inviting meadow and rock outcrop. It is often used by visitors of the Museum of Natural History across the street. A network of soft-surface paths radiates outward from rustic benches at the Central Park West entrance. 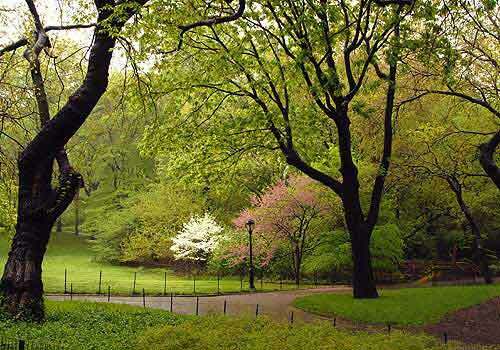 Parkgoers can follow one pathway north, leading past massive royal paulownia trees that bear large, grapelike leaves and impressive outcrops of Manhattan schist. Head south into a valley landscape with a broad meadow; small stream on its far eastern edge is the vestige of the former arm of the Lake that was filled in during the 1930s, and was known as Ladies Pond. At the southern border of Naturalists' Walk is the West 77th Street Arch. The massive gneiss and ashlar structure leads to Azalea Walk to the south, with its colorful springtime variety of azaleas and rhododendrons. West Side between 77th and 81st Streets.